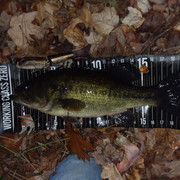 One bite on Saturday morning.Crawling the 9" Slammer ever so slow. Good one..I want to get out two days this weekend.. Stuck one Monday the 29th and since then the topwater night bite vanished.Time to come back to the light and throw subsurface lures during the day. I had a good weekend...4 good smallies on silver buddies..
Nice! Tried a blade bait before but never connected.Definetly not a confidence bait for me.